Get ready to be inspired as a phenomenal, three-part docu-series from WNBA’s very own, spectacular Skylar Diggins is making its way to Nicktoons’ NickSports TV block starting on March 3rd! The remarkable docu-series titled Little Ballers Indiana focuses on a group of 11 and 12-year-old girls who are a part of Diggins’ Amateur Athletic Union team, the Sky Digg Ballers. The docu-series allows viewers to enter in the lives of these talented and amazing, young ladies and basketball players as they join together and see the importance of teamwork, working hard, and being confident in themselves. The Little Ballers Indiana docu-series brings some incredible girl power and it’s so admirable to see all of these magnificent girls put their hearts and passion into the fantastic sport of basketball. Skylar Diggins is a stupendous role model to all of her fans. She is someone who has made such an excellent impact in the sport of basketball and in the lives of many. People look up to Skylar Diggins as a game-changing basketball player, an inspiration, and a strong and immensely talented woman. Little Ballers Indiana will continue to show just how exceptional Skylar Diggins is and how these terrific, young girls are making their mark in the sports world as well. Little Ballers Indiana will also have interviews with current and former WNBA players including Skylar Diggins, Lisa Leslie, Tamika Catchings, Elena Delle Donne, Candice Wiggins, Niele Ivey and Chamique Holdsclaw. NickSports is a great destination for kids to celebrate their love for sports and features many sensational documentaries, series, movies and more focusing on fan-favorite sports, teams and athletes. 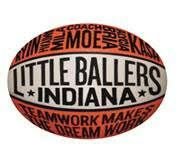 Little Ballers Indiana is a remarkable addition to the NickSports family and is executive produced by Skylar Diggins, Crystal McCrary, Lupe Fiasco, and Amar’e Stoudemire. Get ready to get your game on and be sure to tune in to Little Ballers Indiana premiering on Friday, March 3rd at 9:00 PM ET / PT through Sunday, March 5th in the Nicktoons Nicksports TV block! Follow @Nickelodeon and @NickSportsTV on Twitter and use the hashtag #NickSports to join in on the social conversation! Previous Article: Jillian Rose Reed And Marty Shannon Had A Phenomenal Time At The Warner Music Group GRAMMY Party! Next Article: DJ Sensation Florian Picasso Released His Mesmerizing Single “This Is Our Time” – Listen To It Here!